Strategic Affairs Minister and Deputy Prime Minister Moshe Ya'alon welcomes Netanyahu's UN speech. Strategic Affairs Minister and Deputy Prime Minister Moshe Ya'alon welcomed on Thursday evening Prime Minister Binyamin Netanyahu's speech to the United Nations General Assembly. 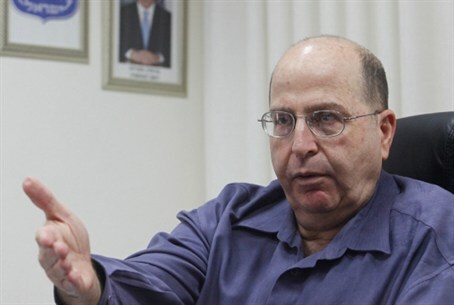 Ya’alon noted that setting “red lines”, such as the one Netanyahu demands be set for Iran's nuclear development, has in the past proven to have saved lives. He added that Netanyahu’s speech was "based on historical experience in putting red lines in front of rogue regimes. Where red lines were drawn, it was possible to stop the evil, and when this didn't happen, the evil managed to kill no small amount of human life." “The Prime Minister also made clear the urgency to act against Iran in light of the progress of its nuclear program, and the importance of joining hands with the Western world, led by the United States, to prevent the rogue regime in Tehran from acquiring nuclear weapons which will threaten world peace and stability,” concluded Ya’alon. At the same time, Ya’alon condemned the speech of Palestinian Authority Chairman Mahmoud Abbas, saying, “This is not a speech of peace, not a speech of reconciliation. This speech reflects the avoidance of Abbas from allowing negotiations with Israel as he avoided Olmert's offer and as the Palestinians have avoided in the past.